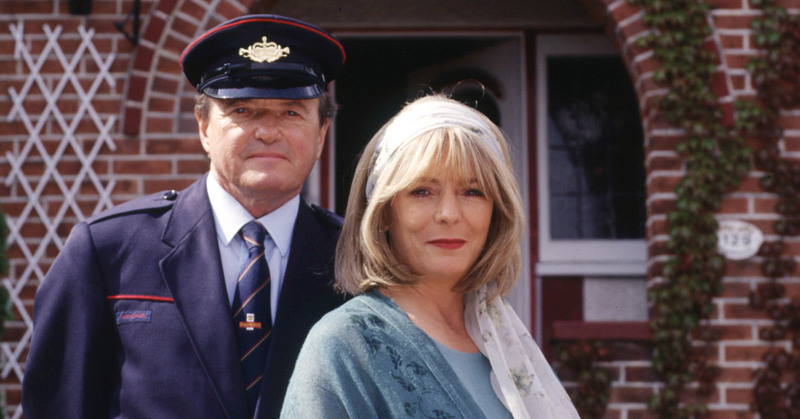 The Missing Postman is a two part comedy drama from the BBC which was first broadcast in 1997. Adapted from his own novel of the same name , Mark Wallington’s tale is a low key comic one of the life changing consequences to sudden decisions. Clive Peacock (James Bolam) is a postman who loves his job. Making collections from postboxes, sorting post at the depot, and delivering mail on his bicycle is his life. In an era when automation is starting to cut the workforce at the depot he finds himself being forced to take early retirement. In a fit of pique on his last day, as he is expected back at the depot with his final postbox collection, he makes the decision to deliver those letters around the UK by hand. And so the adventure begins. Clive Peacock is the very definition of mild mannered, a quiet unassuming chap and the action seems completely out of character – although his quietly snarky response to the idiocy of the world around him is clear sign of the rebellion bubbling under. He and his wife Christine (Alison Steadman) barely communicate – she’s obsessed with DIY and their paths hardly cross. The end of his job, the centre of his world, is the final straw. At first he is reported as missing, but when it becomes clear what he is doing, dogged policeman DS Lawrence Pitman (Jim Carter) is sent on his case. And then the press start to get involved and the people of Britain get behind him. By nature the story is episodic, as Clive travels from place to place. Originally broadcast over Easter weekend in 1997 it is very much of its time – long before the privatisation of the Royal Mail it ruefully hints at changes the age of email was already bringing to the art of letter writing. Although mobile phones do make an appearance, one can imagine how much easier the life of the press and police chasing Clive would be with the existence of Twitter and Facebook. It was a time teetering on the brink of change and our sympathy is very much with Clive being caught in that crossover moment. The programme has a lot to say about the manipulation of image, the world of the press, the dogged determination of people to do their jobs in the way they know how. A generation of late middle age is depicted with a light touch. There’s not a lot of drama, but it is fitfully amusing. The performances are good, but there is a sense that rather than two 80 minute episodes the story would work better as a one off feature length film. The Missing Postman is a soft, well acted, sympathetic watch of a recent but already bygone age. It passes time inoffensively enough, but bar one extraordinarily moving scene between James Bolam and Barbara Dickson, for the most part leaves the audience emotionally wanting. It would have been lovely to see more of the quiet brilliance of that scene. The Missing Postman is out on DVD now.